I sauteed some garlic and onions in olive oil directly in the paellera, then added chorizo, chicken broth, some paprika, noodles, the shrimps, chopped roasted red bell peppers and let this simmer and cook for some 15-18 minutes until the liquid was absorbed. If you do this in a hot oven, the noodles can get a bit crisp on top, and soft and flavorful under the surface. It was delicious and hardly any work at all. For more specific measurements for liquids and other ingredients, check out this earlier post on fideua. Enjoy! Looks good! Remember that Buffalo Wing popularity began in the same the manner. Unexpected guests. Limited ingredients. Short time. Serrendipidity is the cook’s best friend. I see why you said it is slightly novel since it uses both rice and noodles. Am sure my hubby will think it’s weird, but being pinoy I sure I’ll like it.I remember eating spaghetti with rice!! This looks so good, and you make it sound easy to make! Just went to S & L yesterday to buy some ingredients. Looks like I saw where your fine capellini noodles came from. Got some couscous! I am guessing that the chorizo and shrimps or similar meat bits/left-overs would easily go well with the couscous right? Got some red and white wine vinegar too for pickling, at only 85 per big bottle, which made me regret buying the much smaller but higher priced Japanese brand somewhere else a week before. Betty q, favor please, I was going through previous MM posts and found one of your comments that mentioned your Honey Garlic Salad Dressing. But I could not find the recipe itself. If it’s ok with you, could you please post or send? my e-mail add is kitchenherbs@gmail.com Can’t wait to try the other salad recipes you included in that comment! Did i read that right? pasta… and rice? haha! this dish can indeed become famous in the Philippines as we Filipinoes have the tendency to eat everything with rice… pancit with rice, salad with rice, my dad even eats pinoy style spaghetti with rice! This looks fantastic MM! I remember the first time I tasted fideuÃ¡…I fell in love! 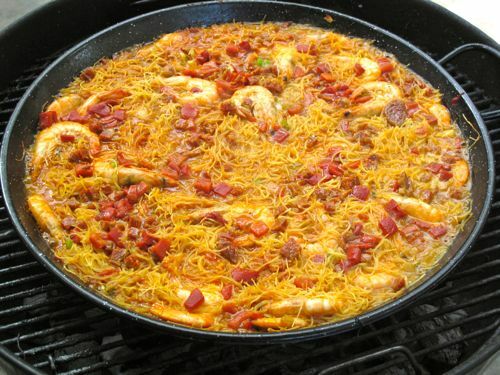 Love it more than paella :) I haven’t tried making it yet though because I am the only one on my family that likes it more! 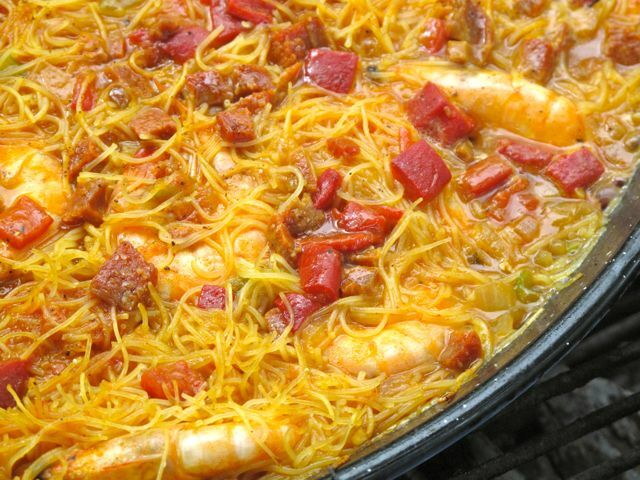 I have to experiment on a fideuÃ¡-for-one recipe :) This one with shrimp and chorizo sounds delicious. This is the first time I’ve heard of fideuÃ¡….is this of spanish or italian origin? Thanks, MM, for being the inventive cook – with what is in the cupboard. Delicioso!! fideua! i had those at mario batali’s tapas place in NY. the dish came with clams. they were sooo good! glad to know angel hair pasta can be used as substitute. MM, I have a question, did you use just regular paprika or the smoked spanish kind? Is the color from the paprika or did you add some saffron? great idea for a dish, will this work in a pan or only using a paellera? it looks like misua to me, yummy..
FideuÃ is very famous here in Catalonia (a region where Barcelona is located)…although it originated in the region of Valencia. Here, they uses shorter but thicker fideos than the ones shown in the pictures. Main ingredients used are: monkfish, squid, cuttlefish, prawns, clams and/or mussels. There are “mixed” versions where sausages and meats (chicken, rabbit, pig) are added together with the seafoods….and optionally served with “allioli” (garlic and oil) which is a catalan version of the garlic sauce. I tried making this dish last weekend using Orzo instead of angel hair pasta with lotsa’ chorizo, shrimps & squid. It came out pretty good. Thanks MM! !